From the robust sockeye salmon runs in Bristol Bay to the well-fed coastal Brown bears in southeast, Alaskan waters produce some of the most viable fish and wildlife populations in the world. These populations have remained healthy, in part, because of limited resource and population development. However, the demand for water is increasing and continued wise management of these resources is essential to the overall economic and social well-being of Alaskans. Water is used for residential purposes, hydropower generation, industry, fish hatcheries, fish processors, agriculture, artificial snowmaking, and other uses. By determining the amount of water available and how much should remain in the river or lake to sustain fish and wildlife, we help promote wise development and conservation that benefits everyone. Figure 1. Five core riverine components (Annear et al. 2004). Instream flow is simply the amount of water flowing in a stream or the volume of water in a lake. Fish and other aquatic and terrestrial species have adapted to natural streamflows and lake levels that provide essential seasonal habitats utilized by the various life stages of each species. 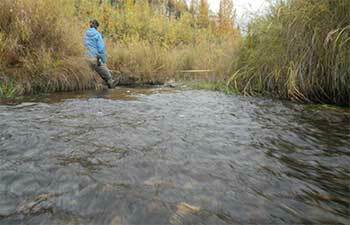 These natural flow regimes play a vital role in creating and maintaining instream habitat that fish depend on to meet their spawning, rearing, incubation, overwintering, and migration requirements. The central character of riverine systems are traditionally defined by hydrology, but in fact, are more completely described when all five riverine components are addressed (Figure 1). These components, and their interactions with each other, holistically determine the character of rivers and all components should be considered in the management of riverine ecosystems (Source: Annear et al. 2004). How are Instream Flows Protected? 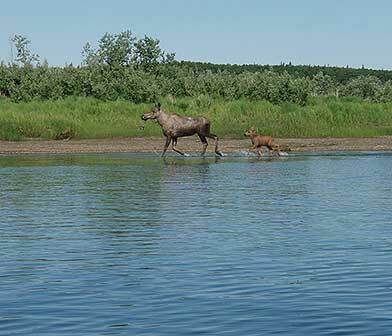 One of the goals of ADF&G’s Instream Flow Program is to ensure there is sufficient water quality and quantity for sustaining Alaska’s fish and wildlife resources. This is accomplished primarily through the following three programs: Reservations of Water, Hydroelectric Projects, and Alaska Clean Water Actions (ACWA). Annear, T., I. Chisholm, H. Beecher, A. Locke, P. Aarrestad, C. Coomer, C. Estes, J. Hunt, R. Jacobson, G. Jobsis, J. Kauffman, J. Marshall, K. Mayes, G. Smith, R. Wentworth, and C. Stalnaker. 2004. 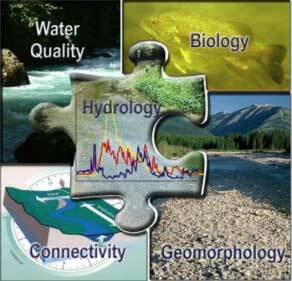 Instream flows for riverine resource stewardship. Revised edition. Instream Flow Council, Cheyenne, Wyoming.